NEW! Announcing a major update of a classic brewing resource. "Technology Brewing & Malting, often referred to as ´the Kunze’ in professional brewing circles, has been the prime resource for countless brewers and maltsters while learning their trade thanks to its practical and comprehensive representation of all aspects of malt and beer production. The text itself contains didactically clear, graphic, and current descriptions from the raw materials to filling and packaging. A truly indispensable resource for both beginning and professional brewers alike!" Wolfgang Kunze, born in 1926, was a qualified brewer and studied brewing engineering at the VLB Berlin. He was a teacher and head of the Dresden Brewing School and introduced generations of brewers and maltsters to the art of beer brewing for 38 years. His comprehensive knowledge and his didactic experience which he vividly conveyed in his book have made Technology: Brewing and Malting in now more than 50 years to what it is today: a standard work – worldwide. Wolfgang Kunze died in 2016. In accordance with his testament, the VLB Berlin continues his work. Under the editorship of Olaf Hendel and supported by the team of VLB Berlin, this standard work will be adapted to the latest state of technology in all future editions. Technology: Brewing and Malting – known as ‘the Kunze’ in brewing circles – has been accompanying countless brewers and maltsters while learning and practicing their trade ever since the first edition was published in 1961. Meanwhile, a total of more than 62,000 copies of this unique reference book have been published in seven languages, with around 34,000 copies in German, 17,000 in English, 6,000 in Chinese, 3,500 in Russian, and 1,500 in Spanish as well as translations into Polish, Serbian, and Hungarian. The size alone speaks for itself, with around 1,000 pages with some 800 illustrations – many of them in color. 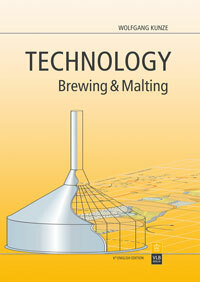 Technology: Brewing and Malting has become a national and international standard work, thanks to its practical and comprehensive representation of all malt and beer production aspects. The 6th English edition is an entirely new translation based on the revised 11th German edition from 2016. It contains didactically clear, graphic, and current descriptions of all essential malt and beer production aspects, from the raw materials to malt and beer production to filling and packaging. The book addresses professional brewer in all sizes, from ambitious homebrewer, craft brewer, micro brewer, pub brewer up to industrial brewer. Because of its clear and thorough representation of all relevant aspects of malt and beer production, in almost 60 years, Technology: Brewing and Malting has become to what it is today: a standard work – across the globe. "Technology Brewing & Malting, often referred to as ‘the Kunze’ in professional brewing circles, has been the prime resource for countless brewers and maltsters while learning their trade thanks to its practical and comprehensive representation of all aspects of malt and beer production. The text itself contains didactically clear, graphic, and current descriptions from the raw materials to filling and packaging. A truly indispensable resource for both beginning and professional brewers alike!"